Ever since I started traveling on my own at the age of 22 I had dreamed of one day traveling to Venice. I didn't want to take that trip on my own or with friends, I wanted to share that experience with my soulmate. Now that I have found him I am ready to show him the world! I saw the world at a very young age and now I can see I was very immature and didn't appreciate every single moment. I'm so thankful for the opportunities my previous job afforded me and I will always cherish those memories. I am dying to go back to all the places I've been to, with more mature and appreciative eyes. The first place I want to take my husband is to Italy. I fell hard for that beautiful country and it really left quite an impression on my soul. I was a broke girl who worked part time at Air Canada and had the chance to travel to Rome with two of my good friends. We hoped on a plane and a day of travel later we arrived at the most postcard worthy place I had every seen, Rome. We were centrally located and had no idea the wonders that lay beyond our doorstep. We started walking through the city and stumbled upon some ancient ruins, the Pantheon and the most shocking the Coliseum. We couldn't believe this was all about a 5 to 10 minute walk from the place we called home. It was truly magical and I want to share that magic with my husband. Before my husband met me he had never seen anything beyond the US. Now he can say he's been to Cancun in Mexico where we relaxed 80% of the time and saw Chichenitza and some smaller Mayan ruins. He loved discovering this new ancient world for the very first time. After that experience he was bit by the travel bug and now wants to see more of the world. If all goes well this time next year we will be exploring most of Italy. I'm very excited to explore the world with him! I never knew the Venice Beach canals existed until a few weeks ago when I saw a blogger take pictures there. It made me realize I still have a lot I want to explore in my own backyard! I love finding the beauty in LA and in a few days I will be exploring Palm Springs for the second time this summer. I love finding little treasures like this and sharing it with all of my readers. My husband and I stopped by the canals around 9:00am on a Sunday morning because we knew how horrible parking would be and we just didn't want to deal with that stress. It was so beautiful and I truly felt like I was in Venice Italy for a second. The canals were surrounded by beautiful homes of all shapes, makes and sizes. It truly is a unique part of Venice not many people get to see but I suggest you stop by and experience it for yourself before heading to the Venice Beach strand. My husband and I make it a point to go out at least once during the weekend. It's not usually a new place but this past weekend we felt a little more adventurous than usual. I wanted to go to Echo Park and explore that side of Los Angeles. I saw so many breathtaking pictures online I had to go check it out for myself. This park did not disappoint! It's even more beautiful and picturesque in person. I was blown away by the beauty of the lake in the middle of this huge park and being able to see the silhouette of downtown LA was the cherry on top. 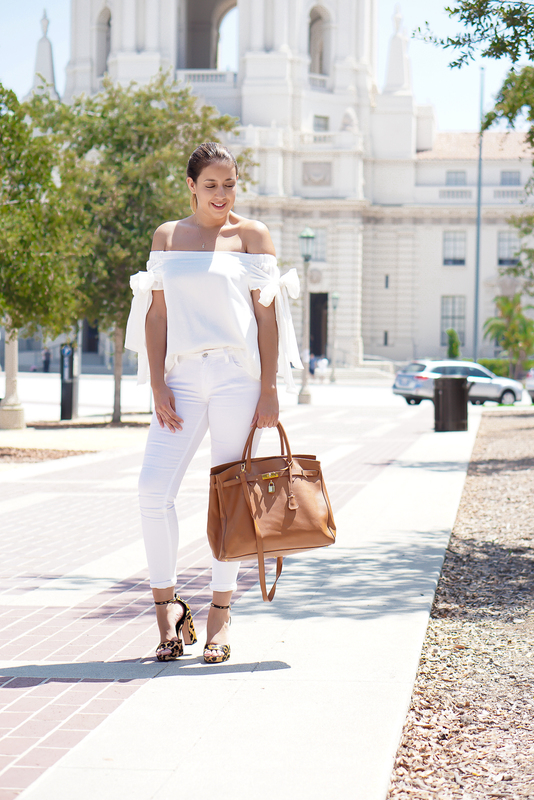 I've been really inspired to dress more comfortably and I always feel comfortable in an off the shoulder top. I have been obsessed with MLM Label and all of there super flowy ruffle tops/dresses. I can't afford to shell out $150 for a top or a dress in this case but I found the next best thing!! This ruffle dress is from Shein and it looks MLM Label inspired for a fraction of the price. The material is thin and flowy which is perfect for this California heat. SheIn quality has improved tremendously from a few years ago, the only complaint I have is the shipping took entirely too long. I'm the kind of girl if I see it, I want it in a week otherwise my excitement for the item will dissipate. Have you ever shopped at SheIn?? How was your experience? I just bought this flower ring from H&M a few days ago and it's quickly become my favorite statement piece for what's left of summer. It looks a lot more expensive than it was and its even more beautiful in person. The perfect piece of jewelry to bring an outfit together. Now lets talk about the shoes!! I am so in love with anything that has the same look as the Chanel slingback's. These beauties are from Zara and they are so perfect! They are comfortable and easy to walk in for long periods of time, I wear them to work and get complimented like crazy. If Zara made more colors I would buy them all in a heart beat!! Can you tell I'm obsessed with anything that looks like Chanel? Well my bag was inspired by a Chanel flap bag and it's one of my most worn pieces this summer. I bought it from Foreign Exchange Clothing which has gone out of business, sadly. I first heard of By Chef Chloe through Aimee Song's snapchats, she raved about how delicious everything was from the burgers to the avocado toast. At the time they only had one in NY but this year they opened one in LA and I had to try it. I am not vegan or kosher but I love the idea of trying something completely out of my comfort zone. How do you have a burger with no patty or a meatball with no meat or mac n cheese with no cheese?!?! We ordered avocado toast, avocado burger, and the quinoa taco salad. The avocado toast was pretty good and the taco salad tasted exactly like it sounded but the main star of the show was the avocado burger! That burger had so much flavor and it actually tasted just like a burger that its in my top 3 favorite burgers of all time!! If you're ever in Silverlake and feel like eating some real wholesome fast food than you must stop here, I promise you won't be disappointed! 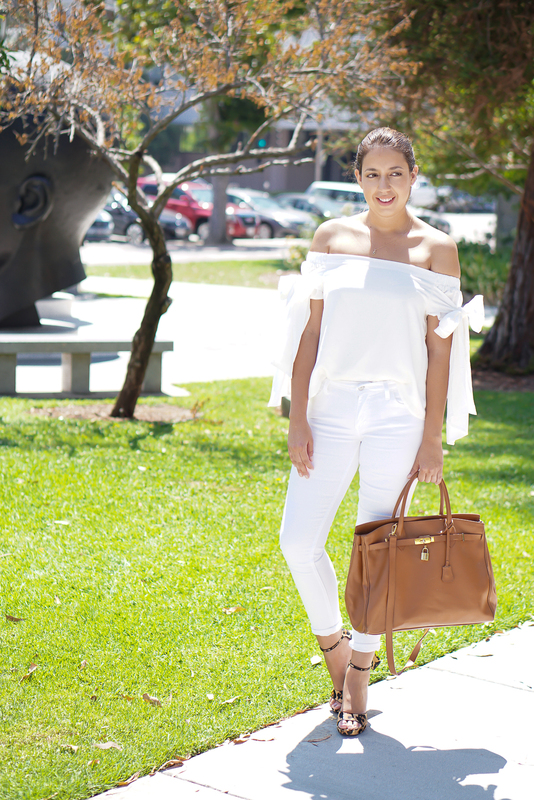 Wearing all white can be a scary thing but sometimes we just want to look clean and let our accessories do the talking! If you follow me on Instagram you may have watched my Insta-story where I shared all of my recent purchases. I was super excited about these leopard print high heels by Coach because I found them at such a great price from Burlington Coat Factory! Yes your eyes aren't deceiving you, I said Burlington Coat Factory! Through out the years I have found such amazing heels at Burlington for insanely low prices. My new babies only cost $34.99 from $130 <insert happy shoe dance>. Now lets talk about this bag!! I mean can we just say dreams do come true!! I literally don't know the origin of this bag because it was a gift to my mother by her boss and she then gifted it to me. I'm one lucky girl because if you know me and you've been following my blog you know I adore inspired by accessories. Do I even need to mention what brand this bag was inspired by?!?! Hermes is such a timeless brand and I hope to one day own something of theres but I doubt it because it's just way too out of my price range. Now that I have this beautiful bag I don't need an Hermes birkin because I have the next best thing. 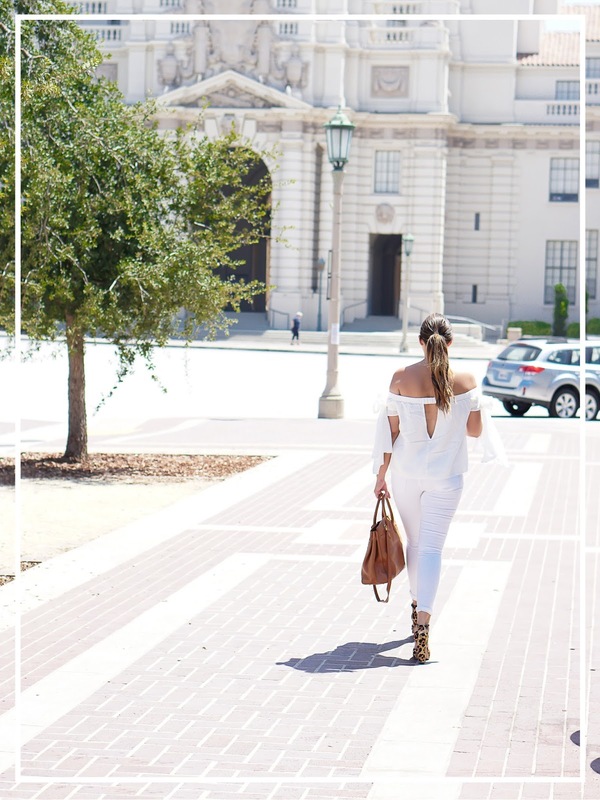 You have to be careful when you wear all white because it can wash you out and be a bit boring. This is why a unique detail can be key to making your outfit stand out and look perfectly polished. 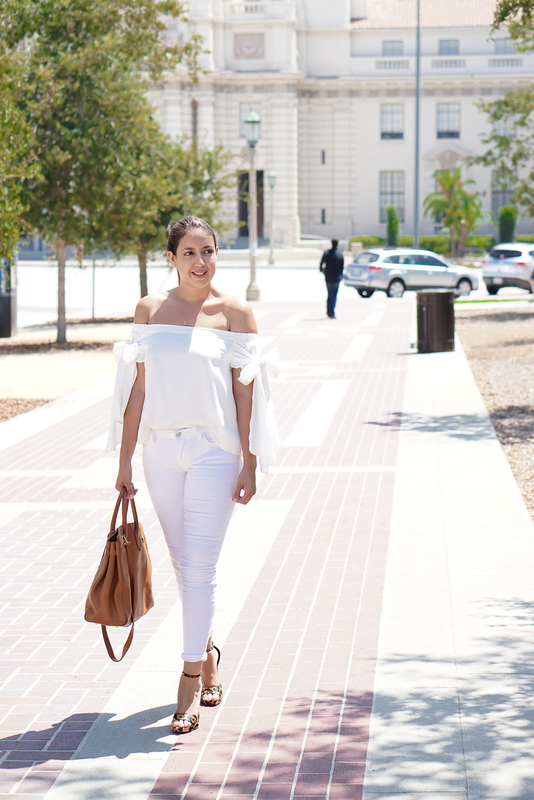 I opted for this tie off the shoulder top from Nasty Gal because it had the perfect bow detail. I don't know why but I've had an obsession with bows for as long as I can remember because they add a touch of class and femininity to anything thing they are placed on. What do you guys think about my bow craze, is it cool or just to much for your taste? 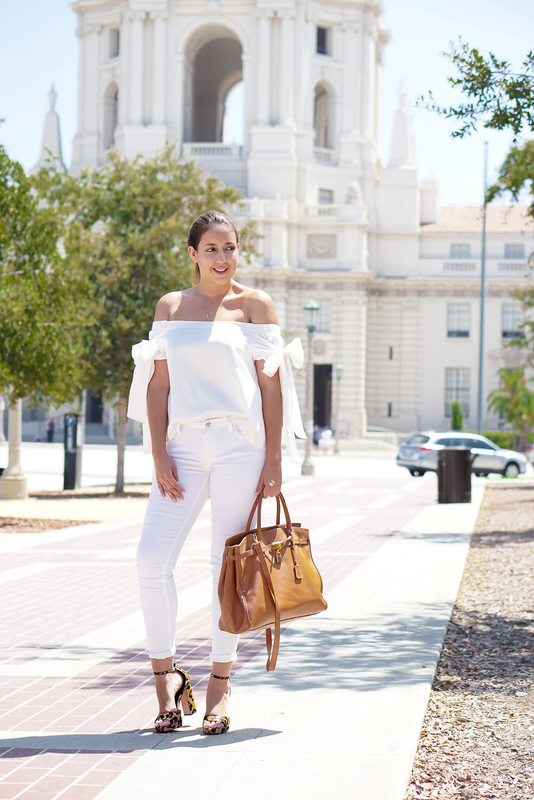 I'm always scared to wear white because I am very clumsy and tend to get stains on everything but I tend to be more prone when I wear white. Why have I been cursed?? I am happy to report no stains where found on this girl the day I wore this outfit!! Shocking because we had messy greasy burgers from Umami (yum) and a build your own popsicle at Stick Station in Pasadena. Have any of you ever been? If not it's a must try because it's so good and you can top it with whatever your heart desires! I will insert some photos of my yummy popsicle below. Hope it doesn't make you too hungry. 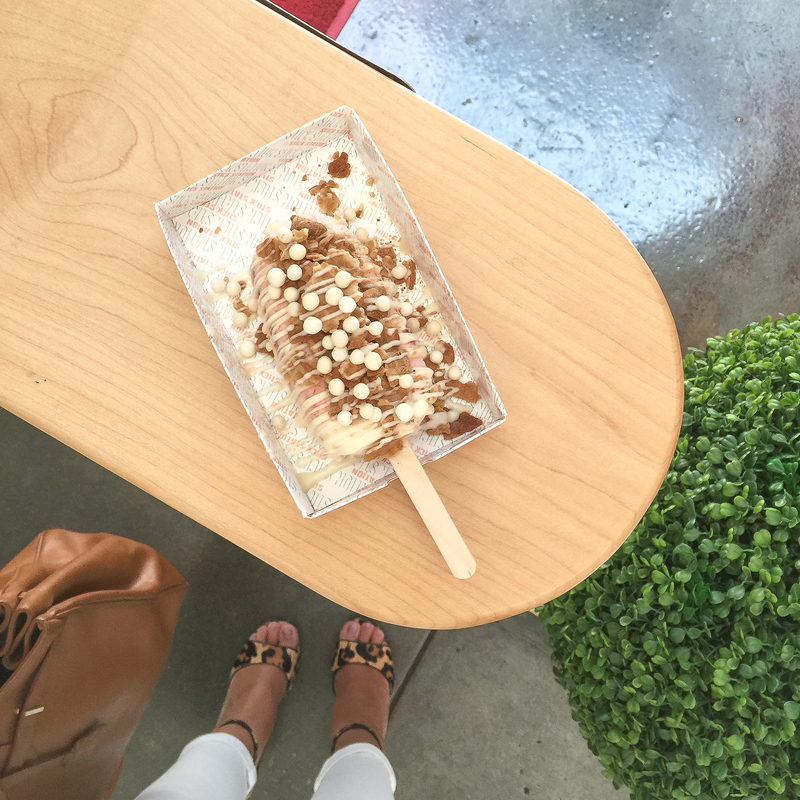 I ordered the strawberry cheesecake popsicle topped with white chocolate balls and crushed waffle cone bits with a white chocolate drizzle. It was very rich but it literally tasted just like strawberry cheesecake and it was the best popsicle I've ever had. That's saying a lot because I'm not a fan of popsicles. It's definitely a must try if your in the area and it's also very Instagram worthy! Summer is in full swing and I couldn't be happier relaxing by the pool every chance I have! 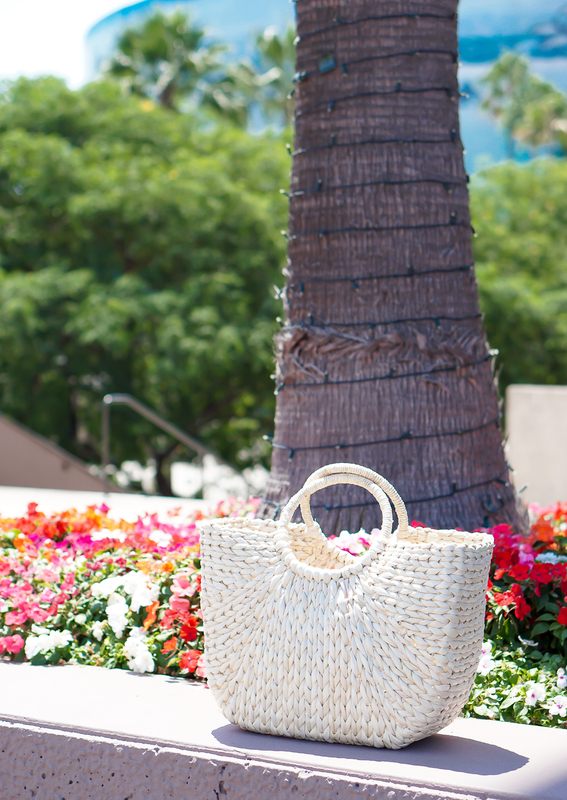 I was in desperate need of a beach bag that was big enough to fit all of my beach essentials while still being simple yet chic. Everywhere I looked I saw this beauty and it was love at first Instagram! That's right, when I'm in search of a new item I always turn to trusty old Instagram! I just received this bag in the mail a few days ago and I had to share with all of you how much I love my bag already! It had quite a few tassels in a row on one side which I immediately cut off because I wanted a very simple neutral colored bag. 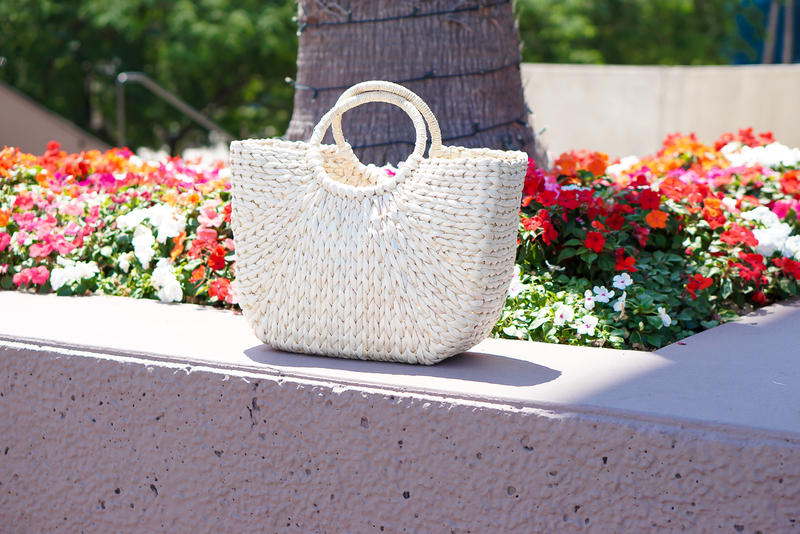 I purchased mine from Saks Off Fifth but it's already sold out <insert crying emoji here> but don't fret because I found some very similar straw tote bags I will link below. One of my favorite trends of all time are uniquely placed bows on accessories or clothing items. When I discovered the amazing designer Aminah Jillil I was obsessed with her bow heels and sandals!! I mean how amazing are the placement of the bows on these sandals!?!? She's a genius and I love all of her designs!! The bow and toe strap are made from genuine leather which reassures the buyer that they are getting a long lasting product. I can attest to the longevity of these sandals because I've had them for 2 years and they are still as beautiful as when I first bought them. I know they are pricey but they are well worth that and more. Without fail, every time I wear these sandals out in public I always receive at least one compliment from a total stranger. It's a very unique sandal that not many people own or even know about so if you are willing to shell out the $200+ for these beauties I promise you won't regret it! Tip: If you buy these beauties keep the stuffing for the bows because its the best way for the bows to keep there shape. Yet another great piece from the Who What Wear Collection at Target. I love this skirt so much because it's so flattering on me and the ruffles hide any imperfections. The ruffles add another dimension to this skirt that makes it fun and free flowing. Perfect for a day date or a day out with friends. Hope you all enjoyed this post! I had so much fun shooting this look because I was so comfortable and the bows made me feel a little playful like you can see in the picture above.